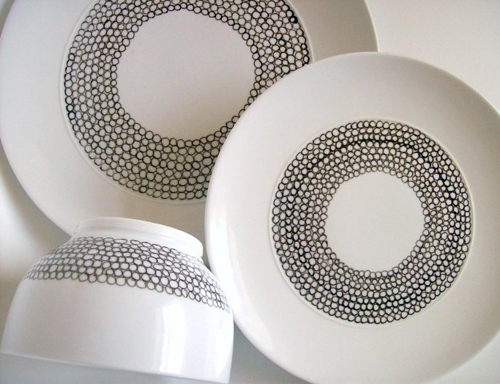 You can easily revamp your white china (from IKEA for example) with a porcelain paint pen (which you can find in a craft store). Once finished, you just bake it at 150`C for 35 minutes and you’re done! What a great idea! And I love the circle pattern, it’s just perfect. I know where I’ll be headed later…. Wow! So cool; I totally want to do that. Nice idea! I think i am going to use it for my next dinnerparty…..put the names (or something sweet ) of the guest on their cups or plates in stead of namecards. I’ve been meaning to do this forever – this is so cute! very cool! I did this on my flower pot. Very cool, And so simple! LOVE this! a merry mishap is SO talented and creative! lover her blog! Love these plates. You make me wanna touch ’em. Black and white – always a classic.